Woody plant encroachment can reduce grazeable acres as well as potentially displace good plants for wildlife habitat. However, not all woody plants are bad for livestock and wildlife. During this field day, you will learn the potential positives and negatives of woody plants depending on differing goals. 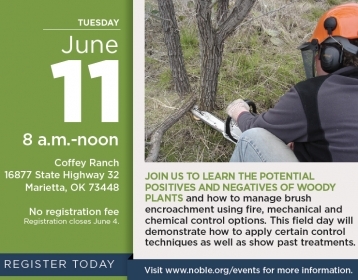 You will also hear discussion on how to manage woody plant encroachment using several different techniques such as fire, mechanical and chemical control options. This field day will demonstrate how to apply certain control techniques as well as show past treatments. Join us to learn how to manage brush for your operation.